K (Ryan Gosling) is a Blade Runner – tracking down the old robot-types who need to be destroyed as they went a bit feral and did some killing of people once. When he comes across a situation that no-one believed was possible, he needs to delve deep to find the truth. Helped by his holographic girlfriend Joi (Ana de Armas), his boss Lieutenant Joshi (Robin Wright) and various others, he needs to track down Deckard (Harrison Ford) and find out what is what. I saw this at Imax, and it was so totally worth it. The soundtrack is amazing (although there were a few times where I was confused about what was diegetic and what was non-diegetic) and it is stunning beautiful. It is also three hours long, which is a really, really long time. I also found that the various twists and turns of the film where extremely obvious and nothing surprised me, yet that didn’t bother me. I enjoyed it for exactly what it was. Jackson Healy (Russell Crowe) is a private investigator who is also a bit of a stand over man. After beating Holland March (Ryan Gosling) to stop him investigating a missing girl, it turns out Healy needs his help to find that very girl. Along with March’s awesome teenage daughter, Holly (Angourie Rice), they find themselves trapsing their way through Hollywood parties and all kinds of conspiracy to figure it out. This should have been so much better. It’s a decent script with great twists, it’s a top cast, it just doesn’t quite get there. Perhaps it is because it was written and directed by Shane Black – looking over his writing credits, he’s a brilliant man – many of my favourite films including Kiss Kiss Bang Bang and The Long Kiss Goodnight – but perhaps he shouldn’t direct as well? I don’t know what it is that makes this fall short, but it does. Set in the months leading up to the financial crash in the mid-2000s, The Big Short follows several characters who predicted what was going to happen and used their knowledge to do stuff. I know that sounds vague, but I actually watched this a while ago, and now cannot recall the ins and outs – I just know that watching it, I found it fascinating, and now I recall it being interesting, but I can’t recall the details. The good news is that I’ll be able to watch it again and find it interesting. What do I recall? Steve Carrell playing another weird and fabulous character. Brad Pitt playing another annoying holistic kind of character. Christian Bale being playing an intelligent weirdo. Don’t remember Ryan Gosling in it at all. Right, I am actually going to watch this film again and then finish this review. Okay, so Christian Bale plays Michael Burry, an oddball character who does a whole heap of research and discovers a flaw in the financial world, relating to bad mortgages and trading on them (technical, technical stuff… blah blah). 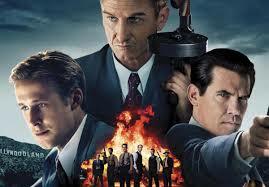 Then Ryan Gosling plays Jared Vennett, which pushes this on to Mark Baum (Steve Carrell). When Mark and his mates go out to investigate, they discover NINJA loans (no income, no job, no asset) which are being packaged with the genuinely AAA mortgages. Then there are a couple of young guys who get in on it and turn to a retired guy, Ben Rickert (Brad Pitt) which knows a lot about the market and is quite suspicious about what is going to happen to the world of finance. The film sets all of these guys up, and while I may not have understood it all, I knew that it was not good. But the film? That is good. Brain challenging movie. The Big Short won an Oscar for Best Writing, Adapted Screenplay and was nominated for Best Motion Picture of the Year, Best Performance by an Actor in a Supporting Role (Christian Bale), Best Achievement in Directing (Adam McKay) and Best Achievement in Film Editing. The Ides of March is a film about politics and power, focusing on those behind the scenes – the campaign managers and interns who are working on the primaries. My understanding of the primaries comes from movies, TV and NPR podcasts, and I believe that the way it works is that the race for President is essentially between two people – a Democrat and a Republican. The primaries are how they decide who those two people will be – the various candidates campaign and then a caucus of the people from that party vote, and eventually someone is picked. There’s way, way more to it than that – for example, this film is set in Ohio, and that is apparently open voting, which means both Democrats and Republicans (and I suppose everyone in between) votes in the primaries. Look, ok, I don’t really know. All I know is, there is a lot of money in it, and the candidate who gets the most votes from delegates then goes on to campaign in the race for President. Stephen Meyers (Ryan Gosling) is second in charge to Paul Zara (Phillip Seymour Hoffman) on the primary campaign of Governor Mike Morris (George Clooney). Meyers is a believer – he plays clean, he is honest, and he believe that the liberal views of Morris can really make the world a better place. During the Ohio campaign, a series of events happen that rob Meyers of his naivety and leave him difficult choices. About three-quarters of the way through this film, I was trying to figure out what Meyers would do next. I felt that things were hopeless for him, but I was unsure whether I even cared. I decided I did, and was then trying to work out what paths he had left open – what was his goal and how would he achieve it. Then I wondered about whether I was enjoying the film or not. During films, I don’t usually think this much – or at least, not consciously. If I am aware that these are my thought processes, is the film not engaging me? This is why I can’t decide if I liked it or not – because I was just so conscious of the script and trying to dissect it. Writing this now, I realise I did enjoy thinking this way during the film – especially because it wasn’t predictable. My main criticism was that the character of Molly Stearns (Evan Rachel Wood) was very under developed. I didn’t believe the choices she made, or the manner in which she made them. For me to believe that Meyers would react in the way he did (I’m trying very hard not to put in spoilers) I needed more about Stearns. She just seemed like an unfulfilled character, and given her importance in the story, the film could have explored her more. As a director, I think Clooney shows a particular penchant for the eyes. Perhaps it’s because his are just so gorgeous, or perhaps it’s because Gosling is able to convey a lot with a subtle lift of an eyebrow. There was an awful lot of eye and eyebrow acting in this film. It’s got a strong cast with the usual wonderful performances from Ryan Gosling, Phillip Seymour Hoffman, Paul Giatmatti and Marisa Tomei. Clooney himself was a much smaller part in the film. I used to think he was a terrible actor – gorgeous, but terrible. That’s changing – between this and The American (which I did not like, but Clooney’s performance was very strong), I think there may be more to him than a charming smile. As far as films about power and politics are concerned, I would recommend Wag the Dog (1997) and Primary Colors (1998) first, but the Ides of March certainly captures the filth of politics and power. 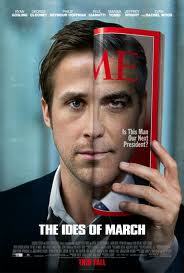 The Ides of March was nominated for an Oscar for Best Writing, Adapted Screenplay. Luke (Ryan Gosling) is a stunt motorcyclist working in a carnival. He sees Romina (Eva Mendes) a woman who he had a fling with previously and discovers that she has given birth to his son, but moved in to a relationship with Kofi (Mahershala Ali). Deciding to dedicate his life to his newly discovered son, he quits the carnival but discovers how difficult life can be without skills and with face tatts. Luckily, he meets Robin (Ben Mendelsohn) an ex-bank robber who scopes out Luke’s skills on the bike and they work together to start-up the old business. Things don’t go great, and in steps rookie cop Avery Cross (Bradley Cooper). The film’s focus turns to Avery and his life in a corrupt police force. After some stuff happens, the story jumps fifteen years. Avery and his wife, Jennifer (Rose Byrne) have split. Avery is running for political office, and Jennifer sends their son, AJ (Emory Cohen) to live with him as he is running off the rails. In his new school, AJ meets Jason (Dane DeHaan), Luke’s son. Without any knowledge of the connection between their parents, they begin getting in trouble together. That’s a pretty difficult plot to tell without spoilers, but I think I’ve done it. I think. Apologies if I spoilt anything. The Place Beyond the Pines is like three different films stitched together. It is very much the old Shakespearean tale of the sins of the father being revisited upon the sins of the son; the story of Jason could be the early days of Luke, yet it is partly the life of Luke that caused Jason’s stories to go the way it did. I think I enjoyed the film, although it is the type of film that it seems wrong to describe as ‘enjoying’ – I appreciated it, I appreciated the beauty of the cinematography and the pacing. The characters annoyed me so much, making bad decisions, or living lives that are the results of many bad decisions. But I still wanted them to work it out. Like one of director Derek Cianfrance’s previous works, Blue Valentine, it’s not quite sadtacular for me, but it’s certainly getting there.